Dental Implant. What are they? A Dental Implant is the most advanced way to replace missing teeth permanently. The procedure is the optimal choice for replacing missing teeth, whatever your age, filling gaps with a crown or dental bridge or to hold loose Dentures in place, known as implant-retained dentures. The adjacent teeth don’t need to be prepared, unlike dental bridges. They simply occupy the space of the original tooth – there are no plates or extra plastic in the mouth, as with dentures. The Implant acts as the missing tooth root. The process itself is relatively painless and involves placing a tiny titanium screw in the jaw bone where the natural tooth came out, which then fuses with the bone to act as the missing tooth root. A crown or dental bridge can then be fitted, restoring both the teeth and gums. An initial implant consultation is vital, so we can understand your concerns and expectations. We then carry out a thorough examination to check your suitability for treatment. This will involve taking x-rays of the upper and lower jaw, to check the available bone and to ensure there is no hidden infection or pathology. Impressions and photographs will also be taken. It is important when considering implant dentistry that you fully understand the treatment and the expected outcomes. There may be alternative treatments you wish to consider, notably a dental bridge or a denture. Once you have discussed the options, we will give you your own personal treatment plan and all the time you need to think things through. If you wish to make a further appointment to discuss any concerns, then we will be happy to arrange this for you. Please call us on 01392 877494 if you would like to know more or to book an appointment. At The Whyte House we are proud to work with Dr Phil Bennett, Exeter’s only European expert in dental implants and past president of the Association of Dental Implantology. Since 1989, Phil has placed more than 5,000 implants and regularly lectures on implantology within the UK and overseas. Trust your dental restoration work to Phil and you can rest assured that you’re in safe, caring and highly experienced hands. As the UK’s first European Dental Implant Expert, Dr Phil Bennett is an ideal choice for anyone who understands that less than perfect implant dentistry would be a compromise too far. 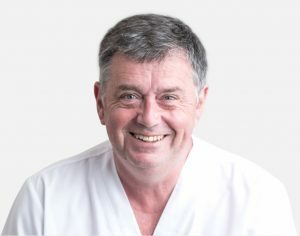 An acknowledged expert in implantology, Dr Bennett draws on his extensive knowledge and experience of all the major dental implant systems, as well as adding dedication and a warm, personal approach to his acclaimed clinical expertise. A Dental implant is indeed a financial investment, but can work out cheaper than alternative treatments in the long run – thanks to the lifespan of the implant. Please see our price list for further details. For registered patients, we also offer finance for up to 5 years for treatment plans over £500, subject to status and T&Cs.